At first glance, it may seem as though this image was taken through a faulty lens, but the mind-bending distortions visible in this Hubble Wide Field Camera 3 impressive image are actually caused by a cosmic phenomenon. The bright object at the center of the frame is the galaxy cluster SDSS J1336-0331. The enormous gravitational influence of the cluster warps the very shape and fabric of its environment (the spacetime around it) creating an effect known as strong gravitational lensing. Through this the light from background galaxies in the line of sight to the observer are bent into fantastic arcs. This effect is very useful for studying distant background galaxies. Moreover SDSS J1336-0331 is interesting in itself: the cluster was part of a study of star formation within 42 of the Brightest Cluster Galaxies (BCGs — the brightest galaxies within their host clusters, as the name would suggest). 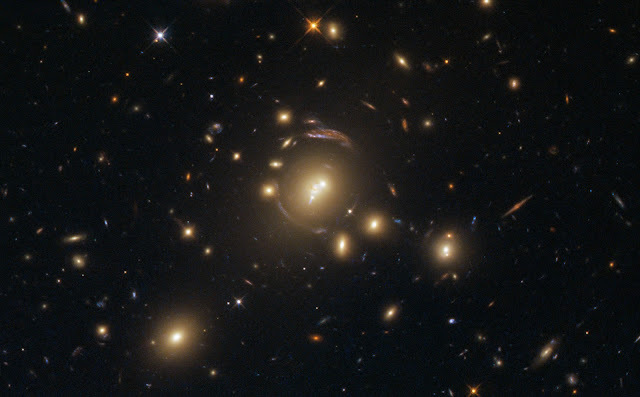 Typically located in the centers of their clusters, BCGs are among the most massive and luminous galaxies in the Universe. They are generally huge elliptical galaxies and are likely to host active galactic nuclei (AGN) in their cores. The study found evidence to suggest that BCGs are fueled by cold gas from the galaxy. It also showed that star formation in older BCGs no longer significantly contributes to the galaxy’s growth; instead, the stellar growth occurs through mergers, the collision of two galaxies. Violent, gas-rich major mergers can trigger intense bursts of star formation in their aftermath.